Personalised Wooden Lovespoons - Heart & Horseshoe. Perfect Wedding Favours, Vintage Wedding Decorations. Ideal Table and Party Confetti. 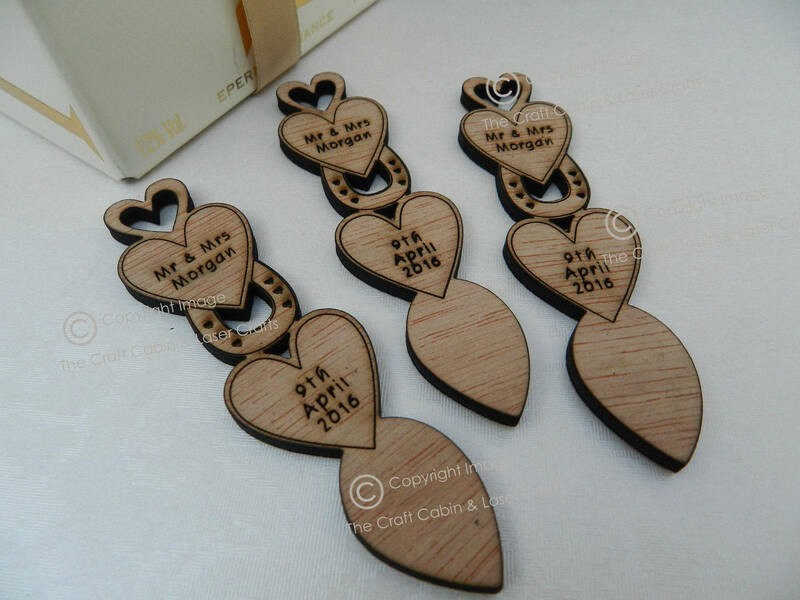 Personalised Wooden Love Spoons - Heart & Horseshoe. Perfect Wedding Favours, Vintage Wedding Decorations. Ideal Table and Party Confetti. Beautiful, laser cut lovespoons. Cut from 3mm high quality hardwood plywood. Suitable for: weddings, anniversaries, birthdays etc. Personalised with names and a date/text in 3 sections. Personalised with your surname/or first names, and a special date, exact same text on all pieces. For single pieces, or spoons requiring different text on each one, please request a quote/custom order/listing. Please state if Mr & Mr, Mr & Mrs or Mrs & Mrs.. If christian/first names are given, we will add the ampersand & sign in the centre.